The well-known colossal statues of Akhenaten from a temple he built at Karnak are among the most fascinating to survive from ancient Egypt. Several of these statues are in the Egyptian Museum in Cairo, some at Luxor and in recent years yet more examples have been on touring exhibitions. (AE featured an article on these in Issue 43, August/September 2007). This is the definitive, and so far the only, book dedicated to these amazing statues; the author has identified more than thirty of the statues, many of which are in storage in either the Egyptian Museum in Cairo or in storerooms in Luxor. Sadly the discovery of these statues was poorly recorded at the time, so the author has had to turn detective to glean as much information as possible from the scanty reports and the very few photographs taken at the time. (Some of the photographs are published here for the first time.) The result makes for a most interesting little book. The author tells of the discovery of the statues (at a site which has still not been fully excavated) and there follows a catalogue of all the statue fragments to survive. I for one was amazed at the scale of the find and the number and size of the statue fragments, especially the faces, which, considering what happened to Akhenaten’s other structures after his death, are often surprisingly well-preserved. 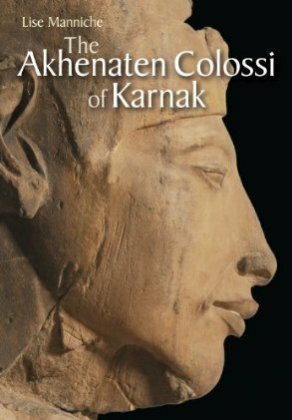 Chapters look at the interpretation of the statues, the aesthetics and the pathology of Akhenaten, which has been the subject of various theories over the years. The book sheds new light on these statues and should be a ‘must-read’ for anyone interested in this important period of ancient Egyptian history One can but hope that this very readable and excellent book encourages others to look again at the statues. Perhaps before too long the site of Akhenaten’s temple will be properly examined. ISBN 978 977 416 349 4. This is a superb little book, designed to illustrate the Nile Cruise, and, as such, it includes only sites from Abydos and Dendera in the north to Abu Simbel in the south. This is the part of Egypt reached by Nile cruises starting in either Luxor or Aswan and also the Lake Nasser cruises. 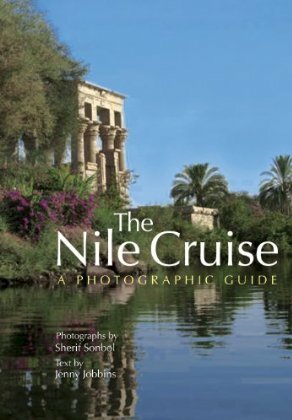 Well illustrated with photos by Sherif Sonbol, The Nile Cruise will be an ideal souvenir if you have actually been on a cruise on the river, or if you are perhaps thinking of doing so. The views will certainly be an incentive to cruise the river, or at least visit, or re-visit, the many sites included. The images are all excellent, and all are accompanied with a short, but accurate and informative text describing the scenes and providing the basic tourist information. Whilst visitors to Egypt could easily replicate many of the views with their own photographs, this book is recommended as it includes many excellent images taken inside tombs and museums, which of course is now prohibited throughout Egypt. ISBN 978 977 416 302 9. Depictions of food are everywhere in ancient Egyptian temple and tomb scenes and food offerings were also placed in tombs for the deceased. All this information has been examined by the authors, who, in this book look at the cultivation, gathering, preparation and presentation of food in ancient Egypt. Clearly ancient Egyptians loved a good meal and the authors here bring together the evidence for all the ingredients. 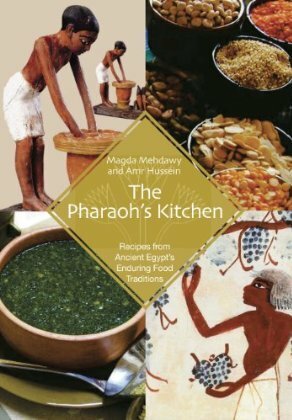 Combining this with their knowledge of modern Egyptian food, they have been able to produce a working set of nearly one hundred recipes, which would no doubt be recognised by the ancient, as well as modern Egyptians. The authors describe traditional feasts and religious occasions in antiquity, some of which are still celebrated in Egypt today. The book is illustrated with scenes from temples and tombs and items in museum collections, as well as photos of the cooked dishes and ingredients. With a good historical introduction that covers food and drink, the home and kitchen, table manners, special occasions and food for the gods, the book then provides all the information and guidance needed to prepare the dishes. Also included is a useful section showing all the hieroglyphs connected with food and food preparation. AE would be interested to hear if any readers who buy this book try the recipes. Certainly, from the description and images, the recipes all look very appetising. ISBN 978 977 416 310 4. For anyone interested in ancient Egypt, it is often the mythology and the legends of the culture that can be the most difficult to grasp. They are frequently confusing – the confusion caused by the staggering time-span of the civilisation of three thousand years. 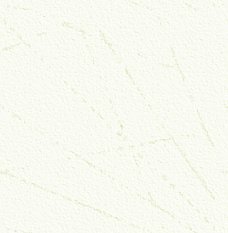 Reliefs and inscriptions on temple and tomb walls and texts on papyrus all record aspects of the ancient religion and beliefs and the author has drawn from all the sources to present the myths and legends in an easily understood way. After an introductory chapter giving a brief history of Egypt and explaining the chronology, the author looks at, in separate chapters: Creation, which relates the several creation myths; interestingly, although they differ, they were all thought to be valid by the ancient Egyptians. Destruction, which looks at the myth of Osiris, the conflict of his son Horus with Seth and the important journey to the afterlife. The Great Goddesses, which looks at various goddesses, including Sekhmet and the story of the Destruction of Mankind, and the story of Isis. Finally, Heroes and Villains, which looks at stories concerning some of the kings of Egypt and the exploits and travels of Egyptians. 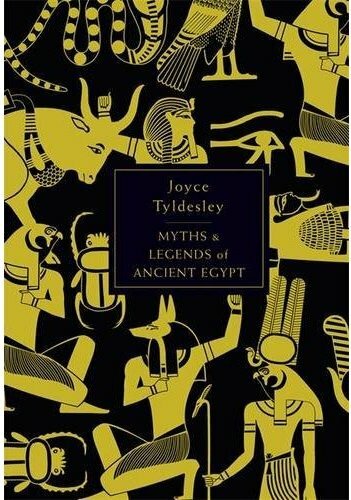 The myths and legends are all fascinating and this is a book that can be easily dipped into; each section can be read and enjoyed on its own merits. Most importantly, the stories told here also help to bring ancient Egypt to life, revealing much about how the ancient Egyptians thought and about their fears and worries. The book is illustrated, though it is difficult to illustrate some of the stories, something the ancient Egyptians themselves seem not to have done. Many such stories were probably told by story-tellers and priests, and passed on by word of mouth. On that basis, perhaps this is one time when one needs to use one’s imagination, as I am sure the ancient Egyptian would have done. If you have been confused by the mythology in the past, or are new to the subject, then this is an excellent, easy-to-read book that will explain all you need to know. Published by Allen Lane, 2010. ISBN 978 1 846 14369 4. It is always wise to travel to Egypt with a good guide-book and this latest fully revised, illustrated edition ticks all the boxes. As is typical of such guides, there is an immense amount of information crammed into over three hundred pages. This includes the history of Egypt, not just the antiquities, but Coptic, Islamic and modern Egypt too. There is information on how to get around Egypt, wildlife, eating out and, of course, sightseeing. 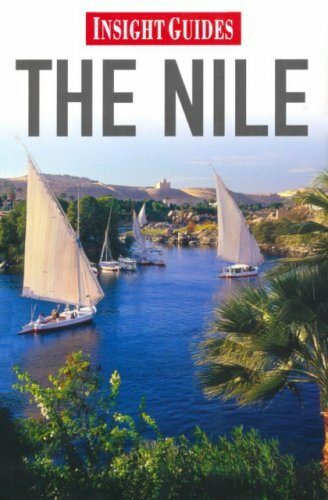 As the title implies, the contents of this guide include the whole length of the River Nile from its source to the Mediterranean Sea. This means that there is also information between its covers about Ethiopia, Sudan and Uganda, countries that share the river with Egypt; but it is the Egyptian part of the river that is chiefly covered in this colourful, informative, and very practical guide. Published by Insight Guides, 2010. ISBN 978 981 282 254 3. The title, and to some extent the cover design, of this book do not, to my mind, do its contents justice. Written by a well known and respected Egyptologist, who has been working at the site of Mendes for many years, this is a perhaps long-overdue book that will be welcomed by many. Mendes is a well known, but infrequently visited, site in the Delta. Like many Delta sites the area of what was once a large temple complex and city has been robbed of most of its stone, so visitors today are faced with an often bewildering overgrown area of crumbling mud bricks and fragments of stonework. I wish that I had had this book before I visited the site a few years ago. The author looks at the history of Mendes, a place that was occupied continuously for five thousand years until it was abandoned in the first century AD. It was, for a brief time, the capital of Egypt. 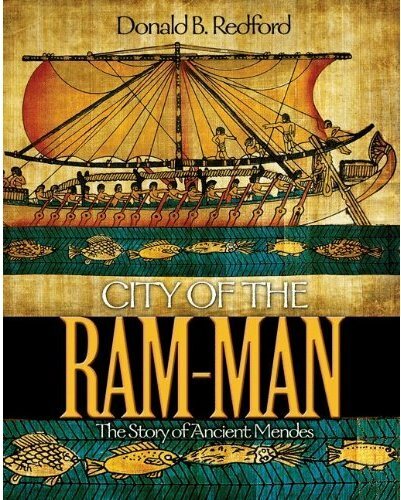 Central to the city was the cult centre of the ram god. This is a book aimed at the expert as well as the more casual reader, for it is packed with excavation photos, drawings and plans. The work deals with the history of the site, in chronological order, and the author unravels and interprets, in a very readable text, the complex layers of history revealed in excavations. With a detailed set of notes to each chapter and bibliography, this book is sure to become a well-used reference work for anyone interested in the site of Mendes in particular, but also in the sometimes complex history of the Nile Delta. ISBN 978 0 691 14226 5. This is a fascinating book covering several thousand years of the history and the cultures of ancient and modern Egypt, which are very different, yet nevertheless have clear links between them. Textual information survives form the earliest periods of ancient Egyptian history, such as the Pyramid Texts, which date from the Old Kingdom but which are believed to be the written form of an earlier oral tradition. Such evidence survives from most periods of pharaonic Egypt and we have visual images, too, of funerals and mourners at the funeral ceremonies. Funeral laments have played a key role in funerals in Egypt right up to the present day, though this tradition is now under threat because of social and political change. The words used by modern lamenters echo the words of their pagan ancestors. Like the early ancient laments, the modern laments are not written down, but are learnt from the women who perform the laments when they sing at each funeral. This means that even today that the laments are changing with new variants at each ceremony. 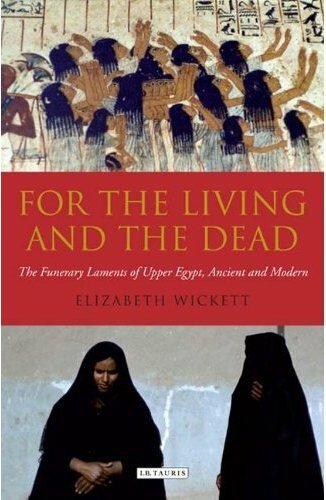 It is therefore perhaps surprising to find, as the author has done, so many links to the myths, cosmology, religion and funerary texts of ancient Egypt in the modern laments. The author was given privileged access to the modern tradition when researching this book. This is a scholarly record of the modern laments, which are poetical and moving to read and not only does it provide a record of the tradition as it is performed today, but it also gives a new and unusual insight to the ancient culture and funeral practices. Published by I.B. Tauris, 2010. ISBN 978 1 84885 050 7. This is the first in what it is hoped will be a series of publications on collections of shabti (or ushabti) figures. The author has already published Shabtis – A Private View, and has chosen, as his first museum collection to publish, the West Park Museum in Macclesfield, Cheshire. The museum has a small but excellent display of ancient Egyptian antiquities, mostly collected by Marrianne Brocklehurst who visited Egypt at the end of the nineteenth century (at the same time as Amelia Edwards, founder of the Egypt Exploration Fund). A foreword by the Honorary Curator of the Egyptian collection, Alan Hayward, describes how and when the collection was made and how it ended up in a specially-built museum. The author then looks at two particular sites near Deir el-Bahri in Egypt, from where most of the shabtis in the collection probably came. 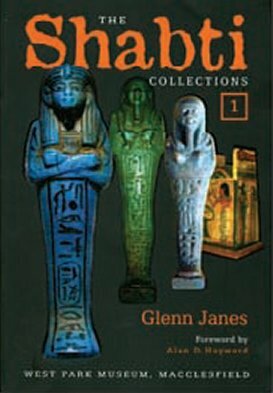 There then follows a beautifully illustrated catalogue of all the shabtis in the collection, some forty-eight in total. As with his previous publication, the author has illustrated each shabti with an image the same size as the actual figure, and in most cases multiple views, so an all-round view of each shabti can be seen. This is a novel, but excellent way of showing the figures, which can probably be seen more clearly in this book than in the museum itself. Each figure is accompanied by a description, notes about its provenance and full details of any inscriptions, with a transliteration and translation. The author, who is an expert on shabtis, then lists any other comparable figures in other collections. This is a superb publication and one which probably sets a new standard for such a volume. It is a scholarly yet very readable book, which shows that even the humblest of shabti figures still has its own story to tell. I can only look forward to other volumes in the series. Published by Olicar House Publications, 2010. ISBN 978 0 9566271 0 0. This is the exhibition catalogue to accompany the Exhibition of the same name, currently showing in Manchester and Cologne. 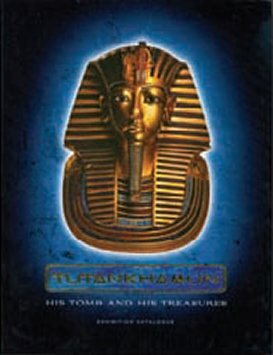 With contributions by many experts, half of the book is a catalogue of some of the replicas of Tutankhamun’s treasures that can be seen at the exhibitions. Together with this there is information on why and how the exhibition was assembled, with excellent photos and clear and concise descriptions. The first half of the book is, however, a very good, well written and profusely illustrated account of the discovery of Tutankhamun’s Tomb and its clearance. There is a good introduction to ancient Egypt to put the life and times of Tutankhamun into its historical context, and a double-page fold-out view of Egypt and the River Nile showing the location of all the main antiquities. As a souvenir of the exhibition this book is good, but as it may be, for some readers, their first introduction to ancient Egypt, it is an excellent publication and may well inspire readers to find out more about the subject. Published by Dieter Semmelmann, Olicar House Publications, 2008. ISBN 978 3 00 025608 0. In 1904, Theodore Davis made a small discovery – a cache, which he assumed was all that remained of the burial of Tutankhamun. 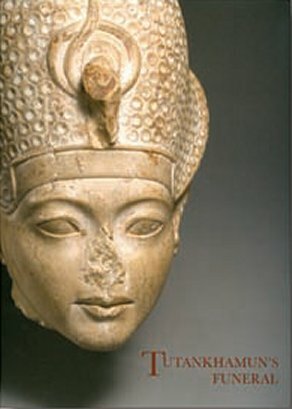 The objects were sent to the Metropolitan Museum in New York, where, several years later, Herbert Winlock realised the significance of the discovery: that it represented the remains of the funeral feast of Tutankhamun and items which had been used in the embalming process – a sure indication that the then-undiscovered burial of the king had been made nearby. This book is essentially a re-print of Winlock’s original publication on the subject, but with many new colour photographs of the objects found. It was produced to coincide with a special exhibition on the king’s funeral at the Metropolitan Museum. Included in this new publication is an introduction and appendix on the objects by Dorothea Arnold. These update Winlock’s original conclusions about the find, and also shed light on the mummification practices of the time and the funeral of the king. Beautifully illustrated, this is an important publication on the subject of Tutankhamun and useful for anyone interested in the king’s life and death. Published by The Metropolitan Museum of Art, 2010. ISBN 978 1 58839 369 2. 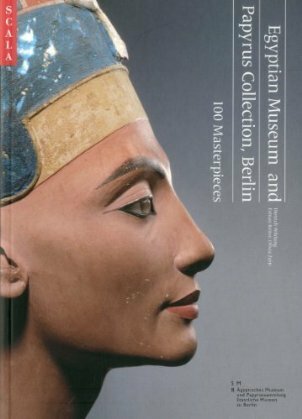 This superbly illustrated book looks in detail at one hundred of the masterpieces from the Egyptian collection in the recently rebuilt and re-opened Neues Museum in Berlin. Many of the objects are now on display for the first time since 1939. The objects have been selected from all periods of ancient Egyptian history, into the Coptic era, including, of course, some of the important Amarna Period pieces, such as the famous painted head of Nefertiti and some of the wonderful plaster heads. As a souvenir of any visit to the Museum, this book is ideal (though I suspect that readers might wish that more than a hundred objects had been included) but it is certainly a good advertisement for the the collection and should encourage readers to make the journey to Berlin to see the rest. Published by Scala Publishers Ltd, 2010. ISBN 978 1 85759 624 3. 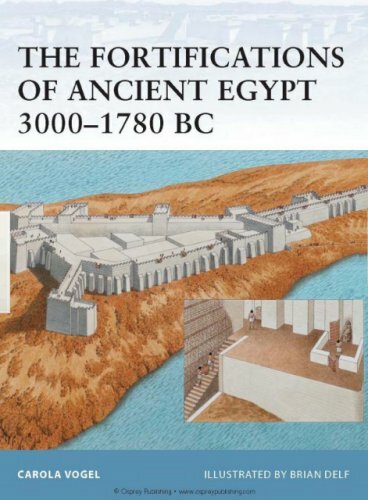 This new title from Osprey looks at fortifications in Egypt from the earliest period up to and including the Middle Kingdom Few of the fortifications mentioned in the book survive. For the very early ones, the information has to be gleaned from the occasional inscription and relief and from archaeology. Many of the Middle Kingdom fortifications did survive, though almost all were lost upon the building of the Aswan Dam and the creation of Lake Nasser, which submerged them. The author draws on all the information available. The book has many maps and plans and some excellent illustrations showing how the fortifications would have looked when intact. These illustrations, by Brian Delf, give a really good idea of the scale of some of the fortifications, which is not always apparent from plans or excavation photos. This is a must-have book, at a very reasonable price for anyone interested in ancient Egyptian Military history. Perhaps there will be a second volume covering New Kingdom and later fortifications. Published by Osprey Publishing 2010. ISBN 978 1 84603 956 0.